EGX, formally known as Eurogamer Expo, is a four day gaming event held at Earl's Court in London. It's the UK's biggest gaming convention and every year attracts more and more developers wanting to show off their upcoming games. There’s plenty of variety with cosplay masquerades, an array of talks you can attend as well as the ability to talk to the devs on the show floor. This year was made even more special with Remedy's presence at the show. They were showing off the extended Quantum Break gameplay footage from Gamescom. Stepping off the tube at Earl's Court Station you are already greeted with a series of video game advertisements, XBOX games on one side, Playstation on the other. The posters lead you around past the turnstiles, an array of small convenience stores and directly to the exhibition centre. You're barely out of the station by the time you see the entrance to EGX. 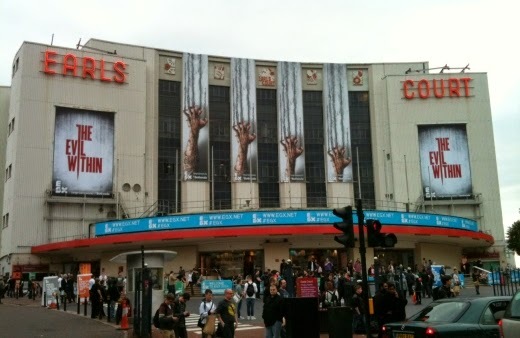 Banners promoting The Evil Within immediately catch your eye, along with the title of the event itself. It's a cloudy day, not necessary cold but certainly threatening rain, yet this doesn’t diminish the enthusiasm of groups gathered outside the show. 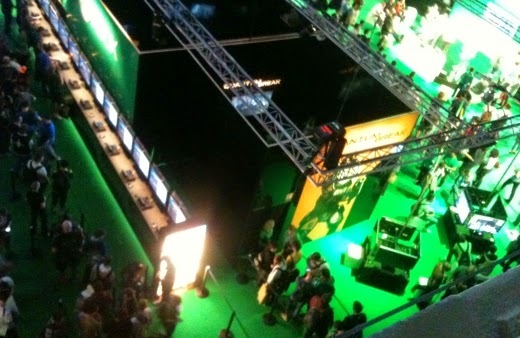 The centre of the show floor, is split into two sections; the XBOX section and the Playstation section, both of which radiates a glow of light in their iconic colour. There's a vague sense of passive and silent intensity between the two parties, yet both are focusing on their own shows. The Playstation section feels more enclosed with cornered off booths encasing an array of games, and a large screen in the centre displaying Twitter updates and photographs. The XBOX section is much louder, literally, with a stage in the centre which would constantly be playing music, showing gameplay footage and hosting interviews. Directly opposite this stage was the Quantum Break booth. Thursday was perhaps the least crowded out of all of the days, but even then the show drew quite a crowd. 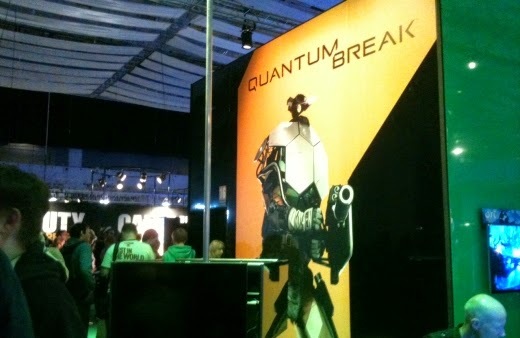 There was already a lengthy line leading to the Quantum Break booth. The Juggernaut concept art greeted players as they waited, the bright orange eye-catching amongst the various shades of green. There was a rope line and a sign reading "You are Queuing for Quantum Break". A guard wearing an XBOX One t-shirt stood at the entrance, holding a selection of trading cards for those who had watched the gameplay. Every few minutes, Ozz would emerge from the booth, check something or talk to someone, or strike a friendly conversation and head back in. Around the time I was heading in, he was preparing for a live gameplay show on the XBOX stage opposite. After 40 minutes in the queue, I pushed aside the thick black curtain covering the entrance and headed into the booth. The booth was pretty small but provided each gamer with a great view. Ten white chairs were placed in two lines facing a large monitor, over which was the Quantum Break logo. Sound-proof headsets were placed on the chairs, allowing each member of the audience to hear the game and the commentary. Lauri (who wore a microphone) and Juho (who was holding the controller) was standing at the front ready to begin the demonstration, both looked enthusiastic and smiled as we walked in. We took our seats. The demo began with a quick description from Lauri about the game's storyline: following a failed time-travel experiment at Riverport University, time begins to break down. The gameplay footage is from midway through the game and shows the effects of the time stutter, as well as introducing new enemies. Whilst Remedy has focused on the game's story in the past, this footage shows off the title's gameplay and combat. We are also told that, as the game is still being developed, what we are going to see is still under construction. The screen then goes black and the game begins. The demo starts off a little earlier than the Gamescom footage, and begins with a cinematic. 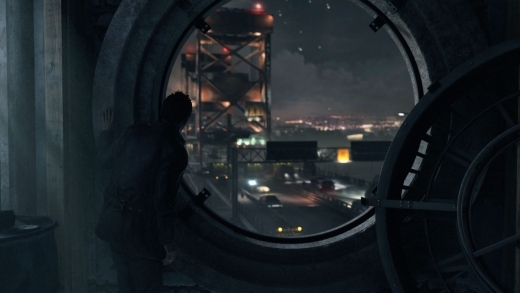 Jack runs to look through an opening overlooking a gridlocked bridge, studying the path he needs to take. Monarch vans are blocking the road, and armoured soliders wearing the butterfly logo are pacing between the cars. Lauri informs us that Monarch has control over the authority in Riverport and their aggressive enforcement has angered the community, leading to a series of protests. 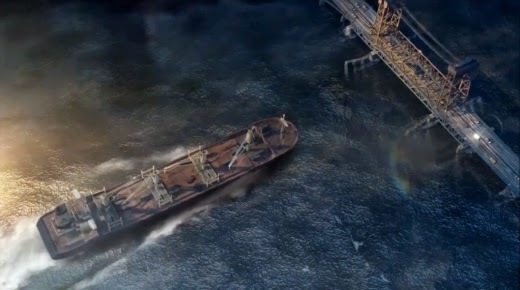 Jack is talking to Beth on a headset throughout the cinematic and into the start of the gameplay, he informs her that the bridge is packed and to take a boat to the port to meet him. "Don't stand me up." Beth warns before logging off, despite the intensity in her tone, it’s clear that their relationship is friendly. The extended gameplay continues afterwards with Jack beginning to tackle the momentous challenge of crossing the bridge. Lauri expands on some of the combat mechanics, especially the final takedown move which causes the car to be thrown towards the Juggernaut. Jack cannot control time stutters, his powers are smaller and more concentrated, what he can do is impact specific objects. In that specific scene, Jack unfroze time on a car which was caught in mid-collision. After his fight with the two Juggernauts, he begins his trek across the bridge; using an unauthorised access section to the left of the road. After a quick climb, we get our glimpse at the cargo ship. Yeahhhh, THAT cargo ship. Lauri turns to Juho "Everything will be fine, right Juho?" Juho gives a thumbs up. Of course it doesn't take long before things go terribly wrong. A few steps along the walkway, and time begins to stutter, the ship jumps forward, back, and forward again crashing into the side of the bridge. The mast snaps and grates against the underside. The bridge breaks in two and cars are thrown by the impact. It pauses, leaps back, and jumps forward again. The sound of splintering metal is combined with the shattering of time. The screen goes black. Jack wakes up, upside down and barely holding on. His leg is twisted around the yellow walkway handlebar, in a massive wave of good luck. He gasps, opening his eyes and the situation becoming a sudden realisation. Regaining balance, he manages to shimmy across and drop down onto a suspended metal walkway below. Time has stopped, midway through the collision. Sections of the stutter are collapsing with objects leaping between two time frames causing them to jump aggressively between them both and presenting time sensitive puzzles. The first of which Jack meets moments after the crash, there's around three time puzzles throughout Jack's voyage across the bridge; my favourite of which involves a truck with an open container which tips out the contents across the path. Remedy describes Jack as an “everyman”, someone ordinary brought into a situation which is anything but. Though he may seem confident in combat, that could easily be connected to a combination of survival and growing familarity as his experience with his time powers grows. Yet, despite demonstration of his confidence in combat, your heart stops a little with each leap of faith the character makes. Official screenshot released by Remedy, Gamescom 2014. The twisted bridge forms an unnatural path consisting of twisted metal and shattered signs, some of the debris is in mid-collision whereas other pieces are further away forcing the protagonist to jump and pray for a positive outcome. The section has a vague resemblance to The Signal DLC for Alan Wake, in which our writer has to work his way through a nightmare of his own creation; and use various objects circulating a slow tornado as his path. You know that Alan could do it, yet you still hold your breath for a fraction of a second. 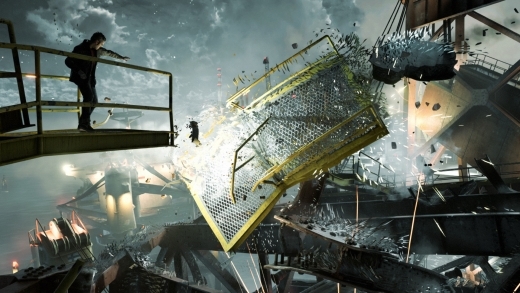 During the collision in Quantum Break, everything is used as a path from structural beams to lumps of concrete and even road signs; all of which gives the impression that the stutter is both fragile and stable; it’s certainly strong enough to support huge metel beams in a fixed position yet sensitive enough to collapse without warning. At a specific point in the demo, certainly my favourite part, Jack is forced to balance on a metal structural beam. Unlike other sections of the bridge, there is nothing below the beam, no splintered metal or lumps of concrete, just the deck of the cargo ship. The screen pans up a little from its usual position behind Jack’s shoulders, allowing the player to get an impression of the depth and danger of the situation, and definitely shows off the game’s beautiful destruction. As we’ve seen in screenshots and videos, whilst time is frozen, objects appear to be fragmenting causing stunning scenes to occur. As Jack proceeds across the metal beam, the player gets a glimpse of the cargo ship below, the hull is fragmenting, the various colours swirling together in an awe-inspiring dance. The scene reminiscent of Van Gogh’s The Starry Night. Official screenshot released by Remedy, E3 2013. The final section of the demo is a little more fast-paced, with the time stutter around the bridge collapsing. The path begins to falter causing some near misses. In the demo’s final moments, Jack’s path ends with a steep incline formed from a cargo container which leads quite nicely to a section of the bridge which is still in its original position. Forced to use the tunnel, he slides down, hitting the concrete hard. Time begins to resume. Cars lurch towards him, and he quickly crawls way, evading the debris by a close margin. The section has a increased sense of urgency, while Jack is desperately moving to safety, the bridge around him continues to collapse; structural beams begin to fall, the sound of grinding metal and crunching concrete more frequent and louder. Jack twists around, glancing upwards as a beam throws itself towards him. He lifts his hands and the metal pauses mere centimetres away from his face, the feeling of relief and shock apparent in his breathing. In the final cinematic, Jack stands up, the warm light of Riverport illuminating our protagonist’s face. He’s one step closer. The music builds up and the screen goes black. Quantum Break combines gameplay with a live action television show, which will be filmed in the coming months. The game is about heroes, the show is about villains. Both will ship as one complete package, and will be released next year. Thank you to Lauri, Juho and Ozz for making EGX incredible! QB was definitely the highlight of the show for me.